I work in the social sector. Gender and Education is my subject. Somehow, I always had this notion that people who work in the social development sector, come with an inherent sensitivity towards gender equality and inclusiveness. However, my many years of working in this sector, has more than often proved me wrong. Day to day instances, however small, of constantly being disregarded in my position despite my experience, just on the basis of my gender is common phenomenon. Having worked with some leading international organizations and very closely with the government, I have realized that being a woman trying to be in a decision making role serves its own challenges altogether. For one, no one wants to take you seriously. Despite running two large scale projects independently, people inside the office have treated me in a patronizing manner. Big decisions around joint projects are taken and I am casually informed of them later. I must point out here that this behaviour is a combination of my gender and age, as many of my older male colleagues think that their experience legitimizes them to take a decision without my consent. In a way I would love to believe that age is the only discriminatory factor, but the inclusion of my male, similar aged counterparts in these decision, leaves me with just one disheartening conclusion. Other instances like being asked to look into aesthetic aspects of a programme, while male colleagues are asked to finalise budgets, being sidelined in large meetings etc are fairly common. Very often at work, it’s a struggle to get your work done and a struggle to be taken seriously for the work that you do. These are issues that, am sure, many, many other working women deal with almost daily. However, I do want to elaborate on a particular instance which happened with me quite recently and am sure I speak for many Indian woman, who have been in this position at some point or the other and have found it equally irritating. A year back, I interviewing for a position in a very prestigious organization doing some really excellent work in the field of education, a job that I was most excited to be considered for. I was being interviewed by the head of that particular section and his one step junior. After a one hour grilling interview process around my subject knowledge and professional competencies, I was feeling quite confident that I would be considered at least for another round. I must mention that I was at that time 28 years old, unmarried, and living in Delhi on my own. We were on the point of wrapping up the interview and had even had the dreaded, ‘salary expectations’ talk. Just then, my interviewer asked me, “so you are single, when are you planning to get married?” Unless he was a possible suitor, (which would be very weird) I found this statement offensive, and highly intrusive. I tried to hide my annoyance and respond in a composed manner, when I asked him, “I don’t see how this question is relevant. Is there any particular reason for asking.”? My two interviewers smiled at each other and the senior of them said, “you know why we have to ask this.” And it’s true, I know why he and many, many other interviewers feel that hiring a single, female employee always runs the risk of marriage and possible relocation, leaving the organization in a soup and the resources they invest in me, a waste. I took this as a personal offense. I understand where he is coming from, but at an individual level it’s an insult to my professional commitment to my own career. Tomorrow I could get married or I could not. However, if I have made a commitment to the organization, it could be a contract of 2 years of more, I will honour that. While many would say that relocation after marriage is normal and thus cause for concern for employers but then, why not ask male employers as well. In this day and age, I assume that most people with a similar background to mine would view marriage as an equal partnership between a man and woman. Why then would you repeatedly look at women as the obligating party, ready to relocate and place marital expectation higher and at the expense of professional commitments? I doubt that any single, man of marriageable age who walks in for an interview and is asked what their marriage plans are. It’s unfair to automatically assume that women will put everything aside, including their career aspirations when it come marriage. I responded to, saying, “I don’t see how my marriage is relevant for this job interview because I take my career very seriously and if I commit to this role, then res t assured, marriage will not be a reason for me to leave.” Thankfully, they seemed fairly satisfied with my answer. I wanted to say more, so that they would think twice before asking anyone other woman this question, but I also wanted the job so I said nothing further. Despite my annoyance, I couldn’t feel angry at interviewer. He is a victim of the same constraints, where he is torn between gendered notions of a woman’s role in society along with his own concern for the well-being of the organization. Maybe he and many more are raising this concern from some experience of hiring a female employee who got married and relocated within months of taking on the role. But to think that it’s justified to ask a very personal intrusive question to every single female person who comes along in for the interview is definitely, in my opinion, unprofessional. I believe that we are currently a society in a state of flux, grappling with new notions of gender equality in the workplace while being unable to shake of some of our regressive ideas. However, it is my humble request to employers and interviewers to please give women professionals the opportunity to be viewed as what they are - professionals. It is also my request to women in the work place to not give anyone an opportunity to think that your position as a woman makes you any less capable of fulfilling your role in the organization and prioritizing you professional aspirations. Overtime we will progress towards a society that has a much more gender neutral work place but till then I request all employers and employees to please build your expectations from your job on the basis of trust and professionalism and you will be rewarded with the same. 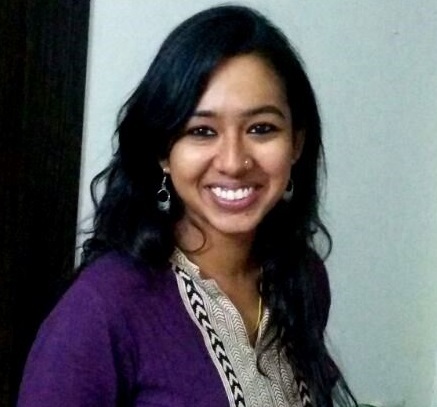 Anindita works with a UN organisation and her primary focus of work is with gender and school education. At a more personal level, she considers herself a gender justice advocate and tries to question gender habits she sees in herself and those around. She studied gender and development in institute of development studies - IDS in Sussex; and an MBA in communication management from Symbiosis University. She loves interacting with nature and the mountains.